Carbide tipped knives can be very useful when cutting difficult wood, man-made, or glued material(s). The carbide inlay of the knife allows operators to keep quality runs on difficult materials while getting longer life and better impact resistance from Centric Inc. brand carbide tip knives. Centric Inc. carbide tip knives have twice the carbide inlay as our competitors (pictured) along with a verity of sizes of both knifes and carbide inlay Centric Inc. carbide tipped knives come in the following sizes width & (inlay[mm]); 38mm(15), 45mm(20), 45mm(25), 50mm(25), 60mm(35), and 70mm(35) carbide inlay. Many other tooling companies only have economy carbide tipped knives in 38mm(15), 50mm(25), and 60mm(35) carbide inlay. 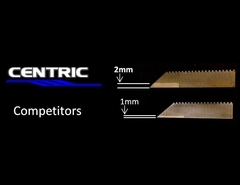 Centric Inc. competitors’ economy carbide tip knives have 1mm thick inlay while Centric Inc. brand carbide tip knives have 2mm thick carbide inlays; that’s twice the carbide inlay than our competitors. Centric Inc. also provides an in-house cut-to-length service for all carbide tipped sizes along with ready to run carbide tipped knives. Centric Inc. has experienced staff can quickly and accurately cut to any length and rough out profiles in-house with our EDM capabilities. Centric Carbide tipped knives are an effective solution for applications requiring longer life than high speed steel and better impact resistance than carbide & backer knifes. Centric corrugated carbide tip knife stock also offers slightly easier jointing than a carbide & backer system.